This 12 sided Vogel Crystal is specifically cut to enhance transformational energies. Quartz is a natural Transformer, and this particular cut produces the most powerful transformational energy possible. 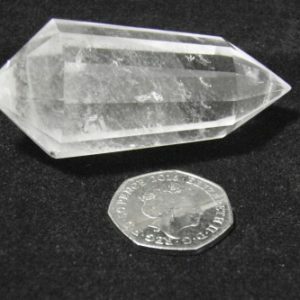 Clear Quartz may be quite common, many of these stones have a very high vibration. They resonate strongly within the eighth chakra, commonly known as the soul star chakra, and within the higher transpersonal chakras. The beautiful clear white light of the white ray is your connection to the Divine Mind, and white is the colour for the eighth chakra. Using Clear Quartz crystals will assist the higher chakras to emanate white light and aids your connection with spirit. These crystals also create a powerful resonance within both the third eye chakra and the crown chakra, which is the highest chakra in the physical body. Although this stone is usually thought of as one of the chakra stones for the higher chakras… it will aid all chakras.